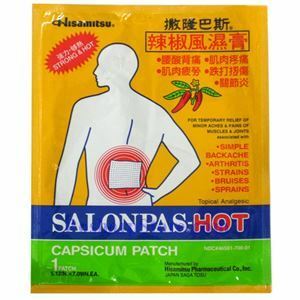 As an external analgesic, this Japanese Hisamitsu Salonpas Hot Capsicum Patch is for fast, effective and powerful penetrating pain relief for dull pain in the lower back with ideal size. It contains capsaicin, a natural ingredient derived from chili peppers and provides a pleasant warming sensation. SALONPAS® HOT releases Capsaicin, a natural, odor free pain reliever, for long lasting pain relief up to 8 hours. Capsaicin, the compound found in chili, cayenne, and jalapeno peppers, is used topically by many medical professionals to help relieve minor pain associated with rheumatoid arthritis or muscle sprains and strains. Capsaicin alleviates pain by wearing down the pain messangers in an injured area. 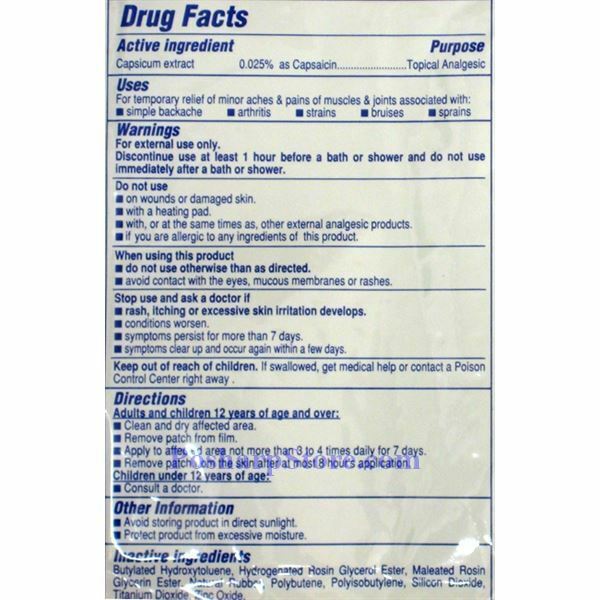 Specifically, when capsaicin is applied to an inflamed or injured area, it stimulates a pain messager called substance P. SALONPAS® HOT has numerous holes arranged in a pattern of 16 vertical and 12 horizontal.